Rachel Von | The Journal Gazette Shelley Mayfield and Jim Hunt share a laugh during a square-dancing session led by Barry Clasper during a national square-dance convention at Grand Wayne Center. Rachel Von | The Journal Gazette Dancers are all smiles during a square-dancing session Saturday at a national square-dance convention at Grand Wayne Center. This isn’t your typical gym class do-si-do. 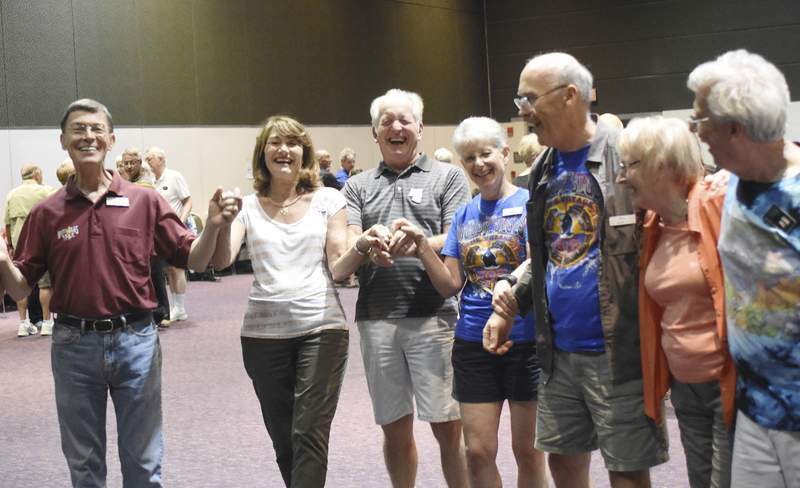 The level of dancers who attend the annual square dance convention hosted by The Academy for Advanced and Challenge Enthusiasts are in a league of their own. For the C3B level of dancers, who are only a level away from the top C4 level, an average call may sound more like a football play: "Cross the sands," "Turn a quarter," "Exchange diamond," then "Strip diamond," and so on. And at this level, you don’t know what the caller is going to call next, participant Paul Howard explained. "So you have to assess whether you’re a leader, trailer, center, end, and then you have to process if it’s a one-person call, a two-person call, an eight-person call, and you have to execute the parts in the call in the right order," Howard said. "The solution to the problem is the formation or the shape you wind up in. So, the Rolodex in your head is going through all of this stuff. It’s real-time puzzle-solving." Saturday was the final day for the annual convention at Grand Wayne Center. Although it’s the organization’s first event in Fort Wayne, organizer Pam Clasper said she and fellow organizers Debbie Ceder and Sandie Bryant, who is also a caller, will host the convention in Fort Wayne next year. 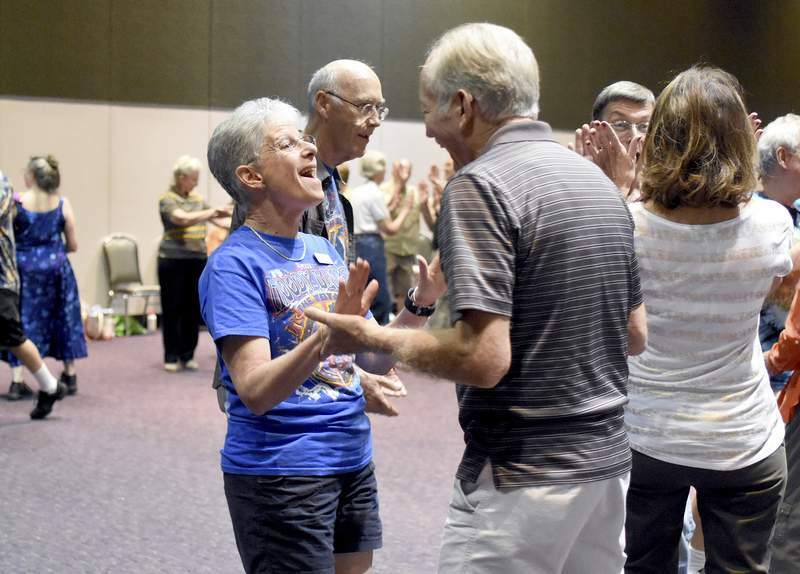 The convention opened Wednesday with focus sessions each morning to give an in-depth look at a call or concept followed by square dance tips. Between each tip, the dancers socialize or practice certain calls until it’s time to regroup. Clasper said 285 dancers registered for the convention, traveling from across the U.S., Canada, Japan, Germany, Sweden, Denmark and England. No matter where you are in the world, a "swing through" is still a "swing through," Clasper said. "There are people who don’t speak English, but we can square dance together," she said. "It’s a hobby that many of us have been doing for many, many years, and we love it very much. People here have been dancing for a number of years. There are various programs and levels, and you learn more and more calls, and so people here have been dancing at least 10 years." As a caller, Bryant had a smooth style. Her calls flowed one right after the other as a honky-tonk version of Janet Jackson’s "Doesn’t Matter," played inside one of Grand Wayne’s Harrison Rooms. She also had some Snoop Dogg and Robin Thicke tracks. She ended her session with the standard, "Take Me to the Moon." "I don’t like country music, even though I’ve been involved in square dancing for 40 years, I hate country music," Bryant said laughing. "All of us have our different things that makes us who we are."